Okay, a lot of you have emailed to ask me to let you know when the new Entertainment Book goes on sale. Well not only is it on sale at $5.00 off but there is also FREE Shipping. Now, I have never been a big fan of the Entertainment Book. I actually thought it was a waste of money until I sat down with my sister in law and went through here book. When I found out there were grocery store coupons inside I was like, what was I thinking. These books are awesome. 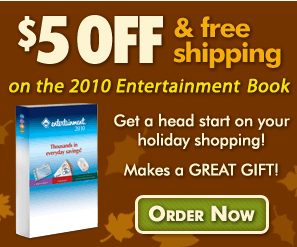 So, if you were one of the ones emailing me, here is your deal on the 2010 Entertainment Book.